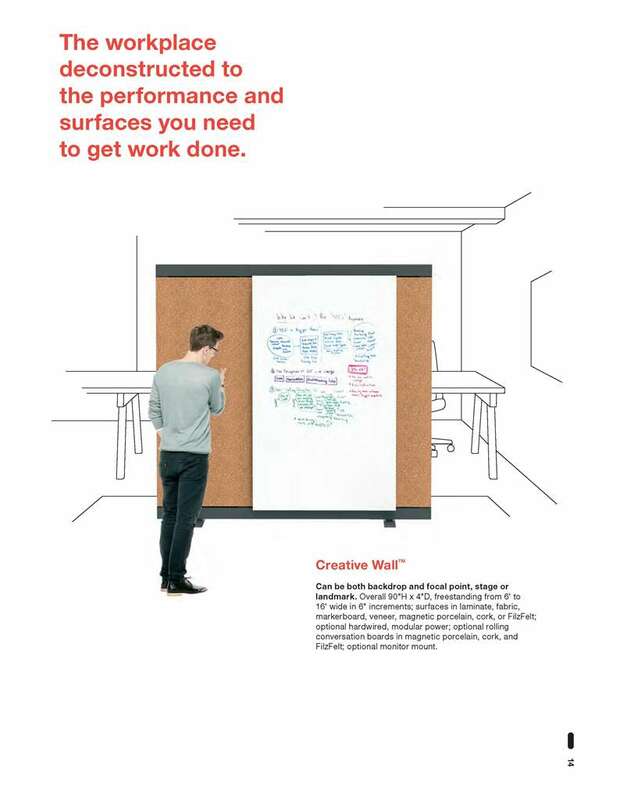 Did you know that many successful ideas come from spontaneous, informal conversations in interstitial spaces, like next to the water cooler? 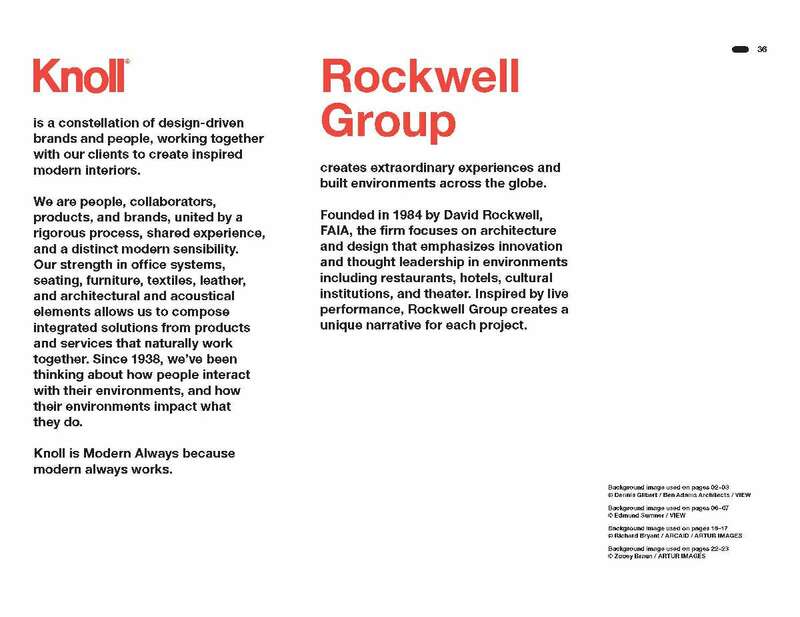 Rockwell Group used this insight for Knoll, to elevate the magic and importance of these “in between” spaces, capturing the unexpected and creating more moments of connection in the workplace with a comprehensive 30-piece furniture collection – across six product categories that adapt to the spontaneous choreography of the work day – creating an unrivaled work experience designed to let spontaneity unfold and people complete the story. 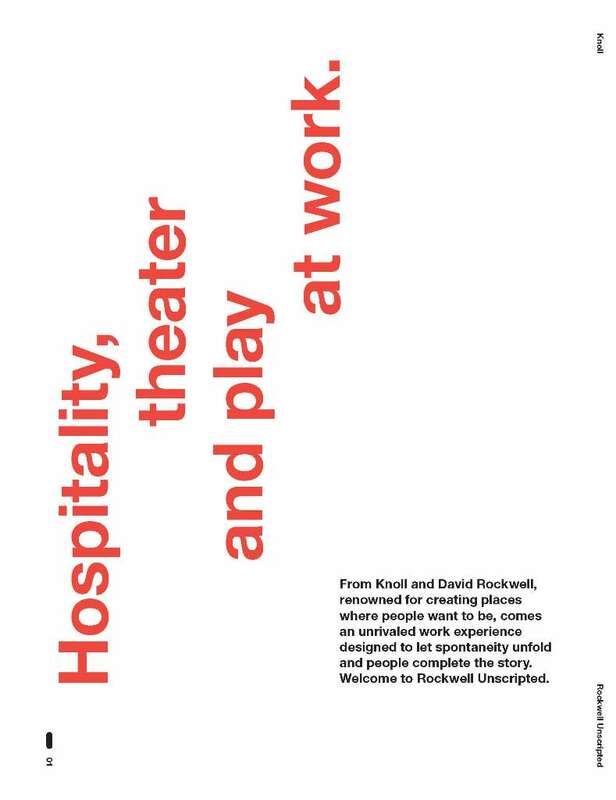 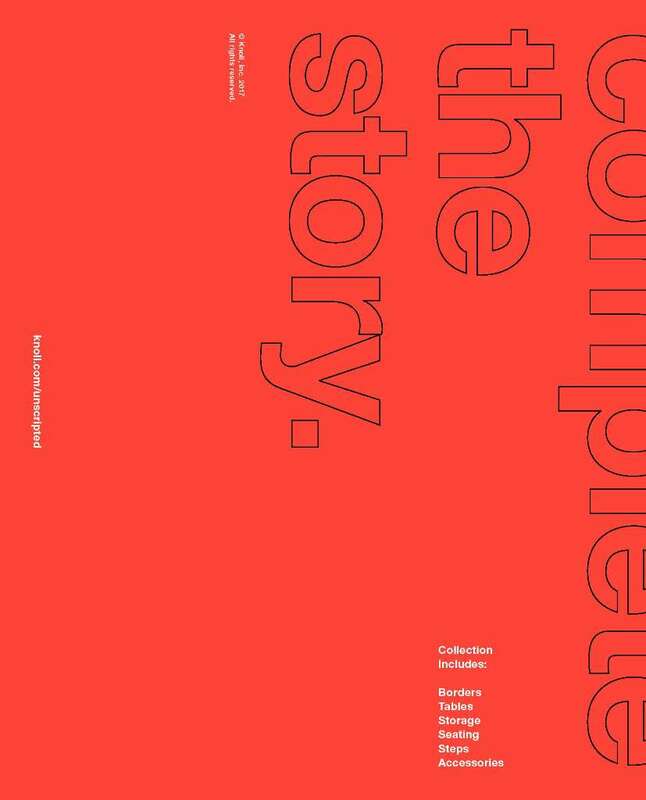 See how Knoll developed Rockwell Unscripted from the ever-changing, office of the future. 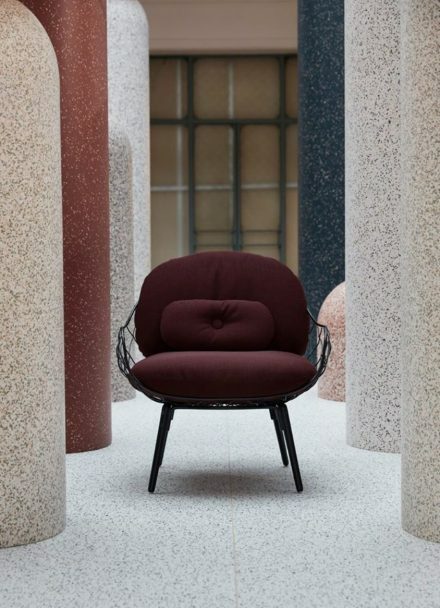 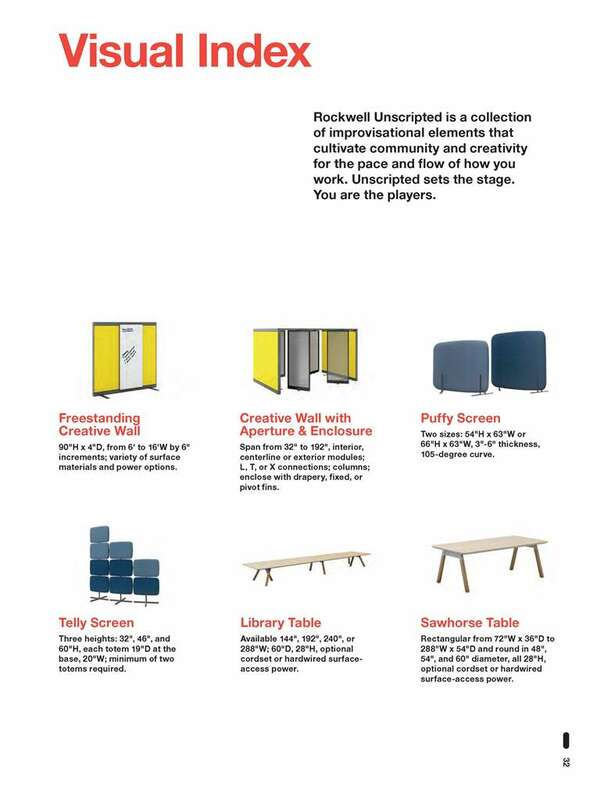 Comprised of an eclectic array of freestanding, architecturally grounded and moveable elements that can be used to create everything from gathering spaces to quiet retreats, Rockwell Unscripted creates the stage for an Immersive workspace. 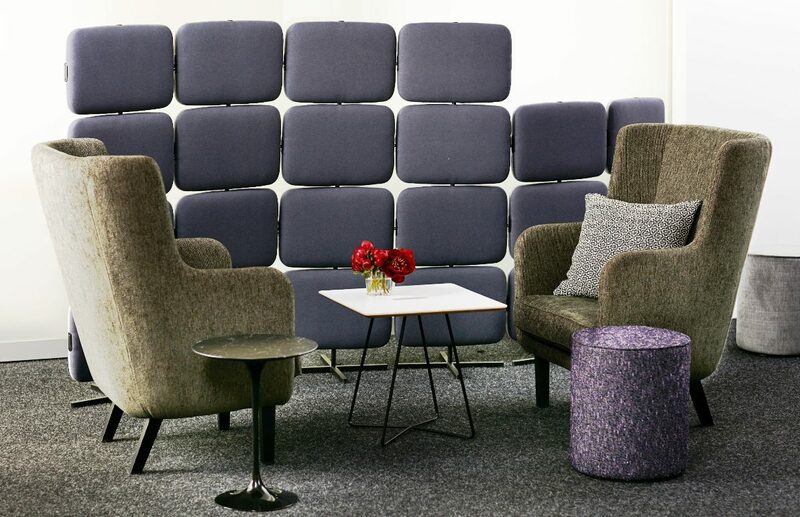 Creative Walls, Puffy and Telly screens and steps evoke the energy of performance, while tables and seating create experiences for work, conversation, and celebration. 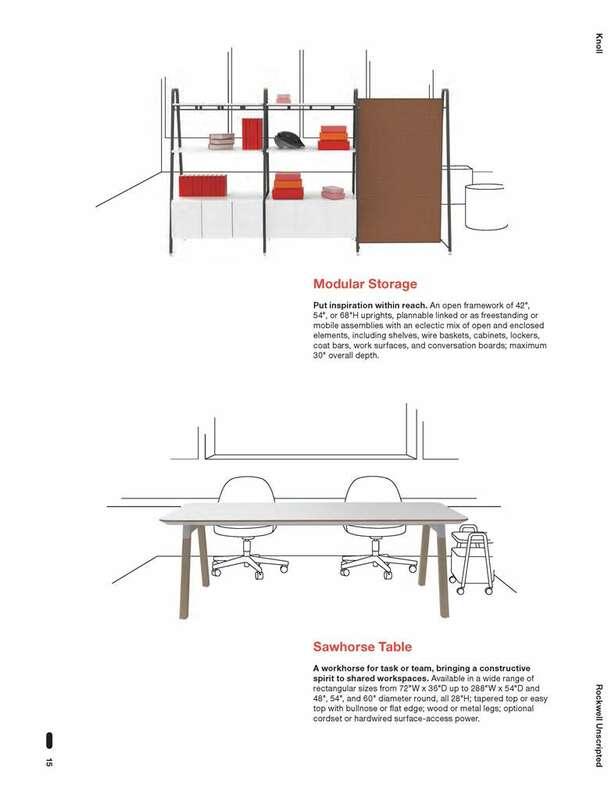 Storage puts inspiration within reach and accessories help you feel at home. 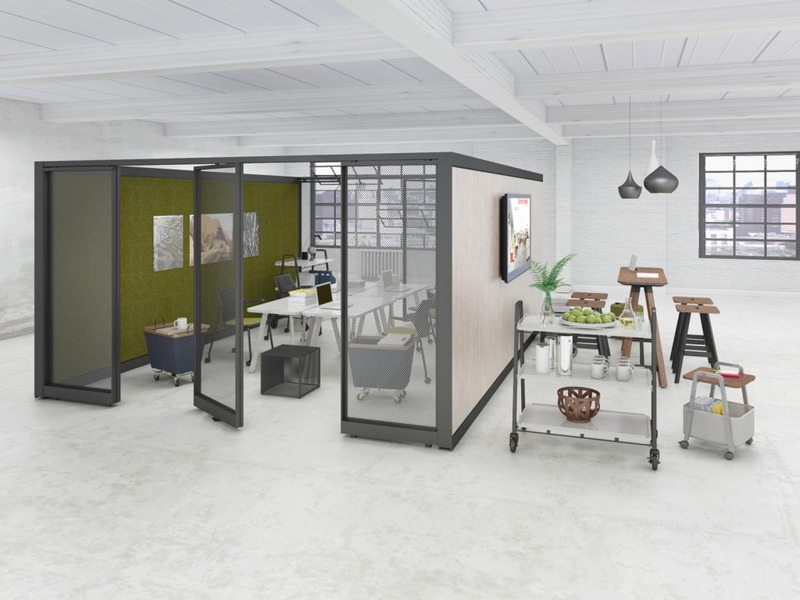 In response, the workplace has taken on a new life, functioning as a town square-like hub energized by the hum of the occupants. 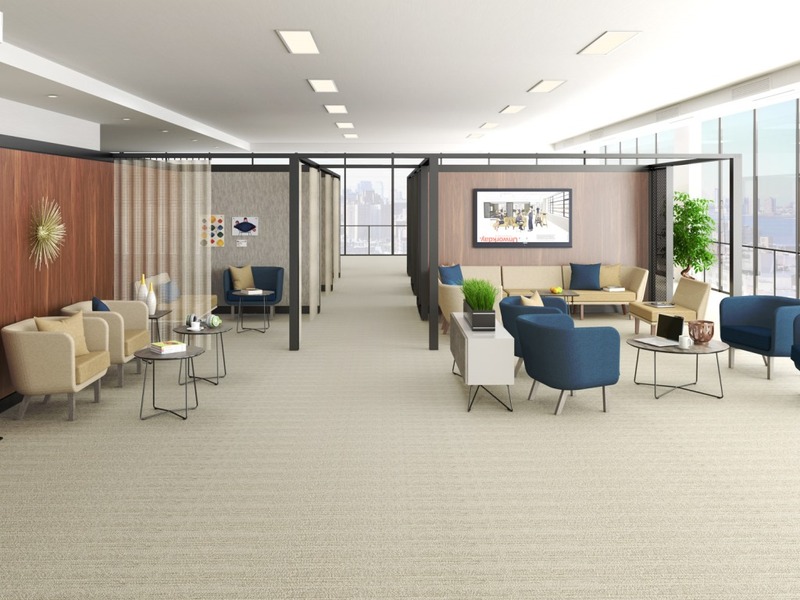 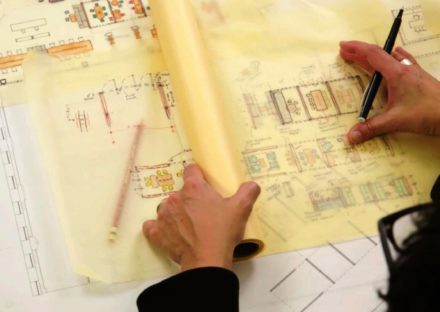 Elements of residential and hospitality design provide comfort for employees who come together to connect, ideate, focus, socialize, or otherwise engage. 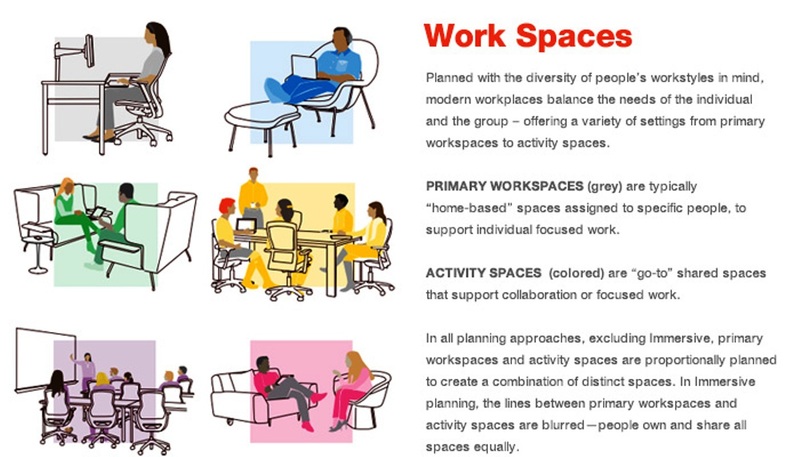 As the pace and change of group-based work challenges the way the workplace functions, blurring the boundary between work and play in the office doesn’t diminish the amount of work being done. 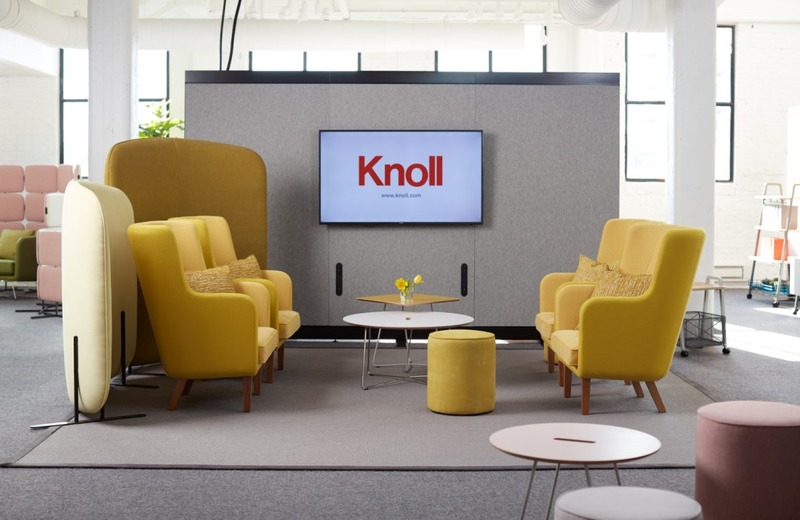 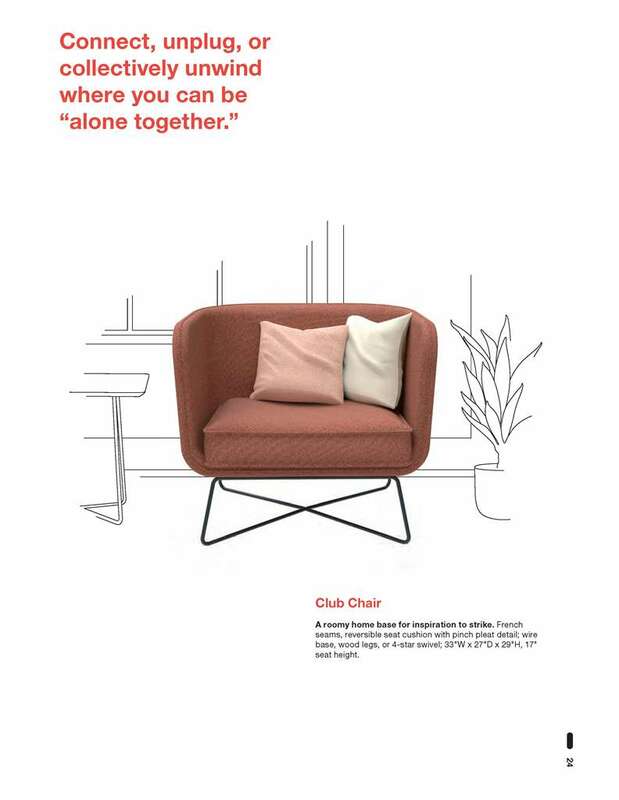 Knoll is a constellation of design-driven brands and people, showcased a range of Immersive workplace planning solutions for commercial, healthcare, and educational spaces at NeoCon 2017. 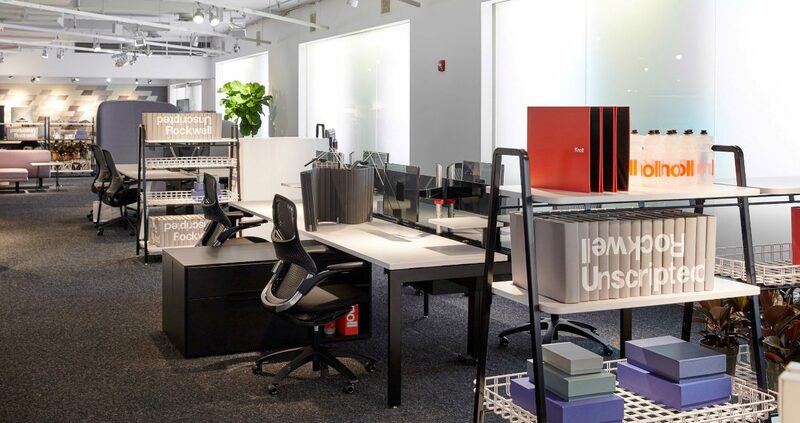 The Knoll Neocon 2017 showroom presented Rockwell Unscripted – a broad furniture collection that sets the stage for an Immersive workplace experience. 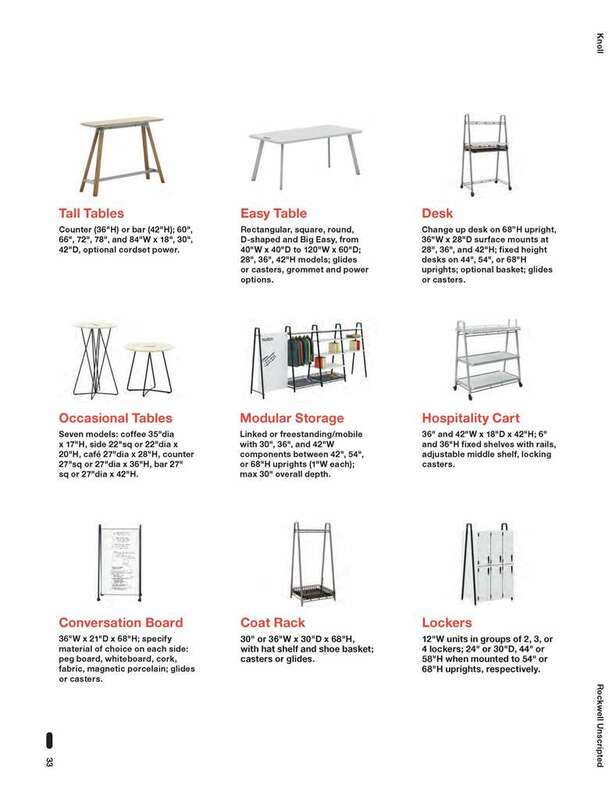 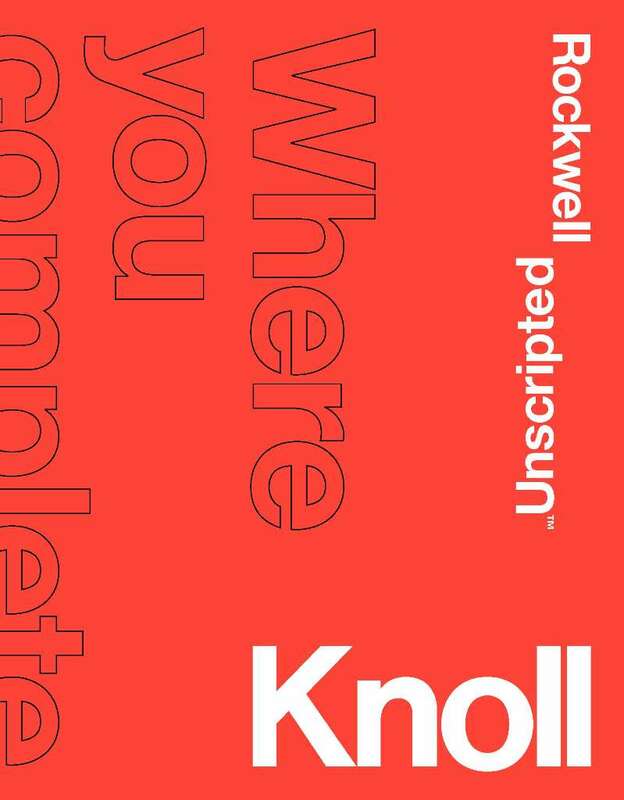 This year’s Knoll NeoCon display builds on the company’s 2016 preview of Rockwell Unscripted, demonstrating how the robust collection of furniture works in tandem with Knoll open plan and ergonomic solutions to make Immersive planning possible. 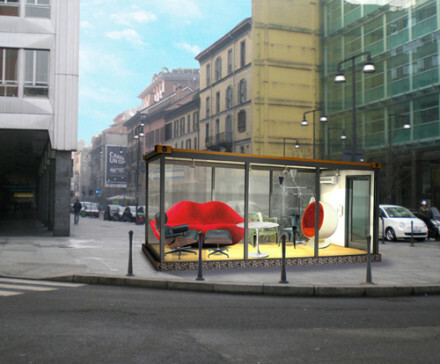 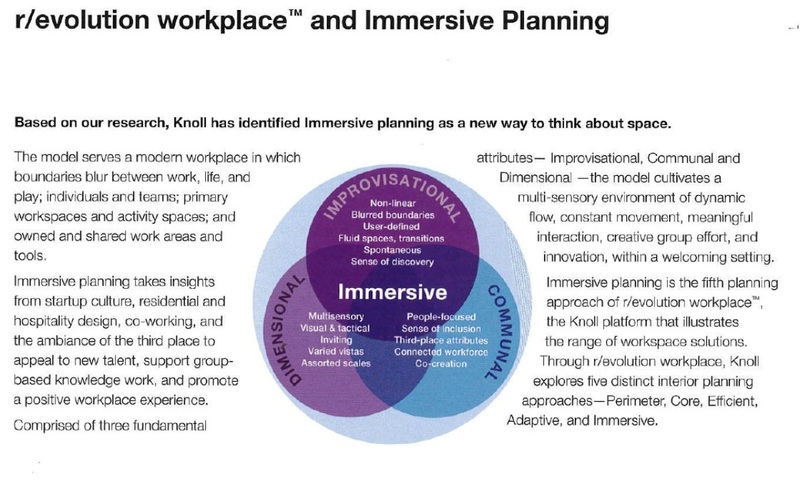 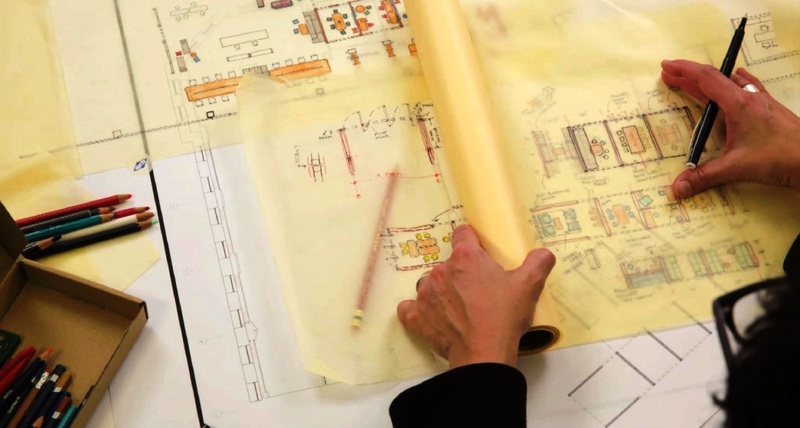 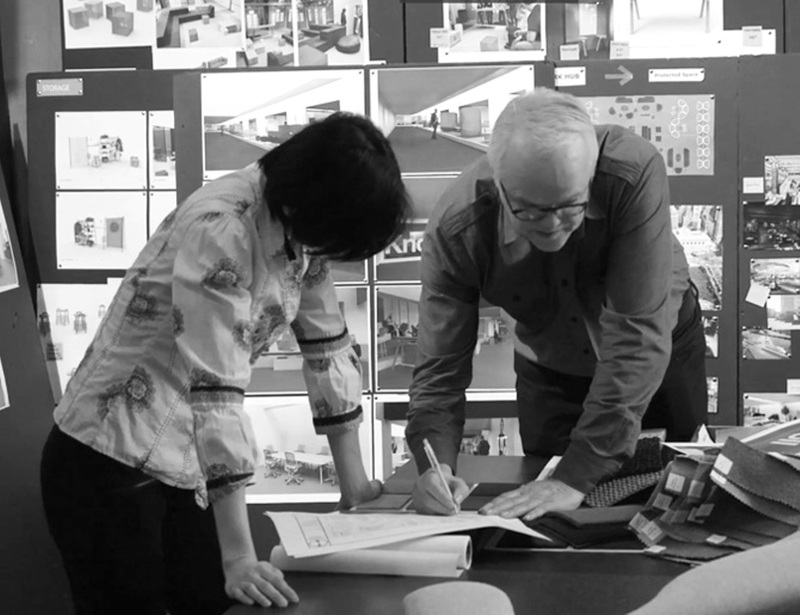 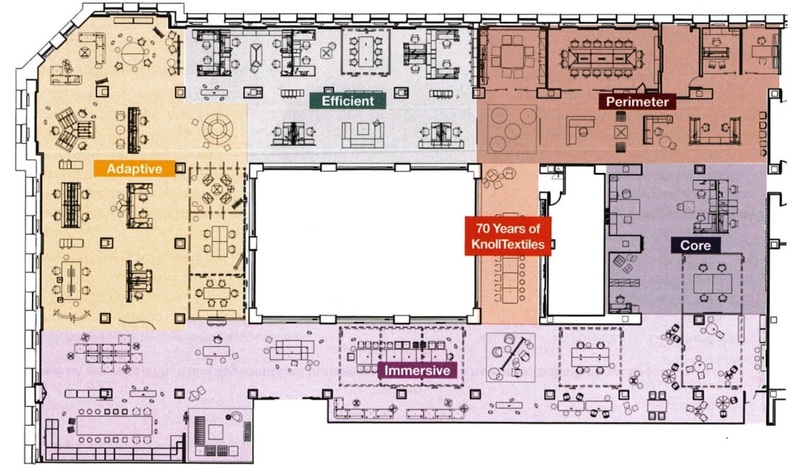 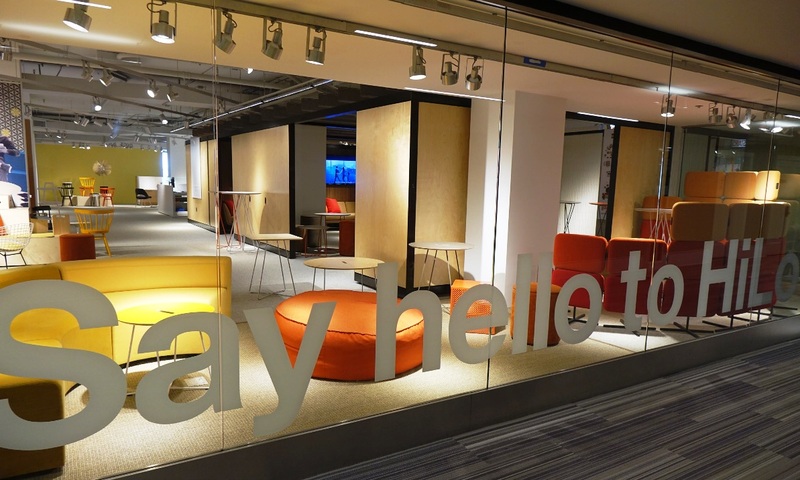 Knoll has identified Immersive planning as a new way to address the contemporary workplace. 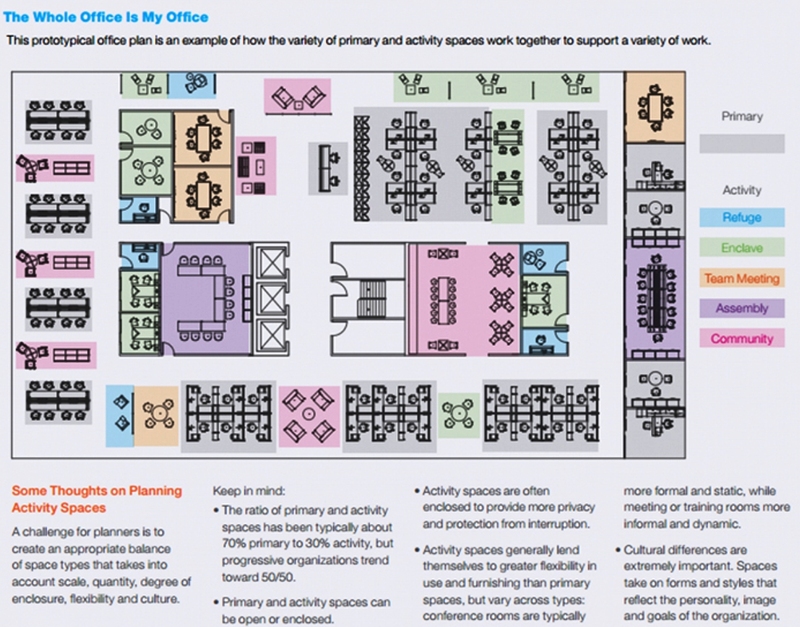 This planning model blurs the lines between work space types, enhancing interaction and connected experiences, and creating a sense of hospitality at every exchange. 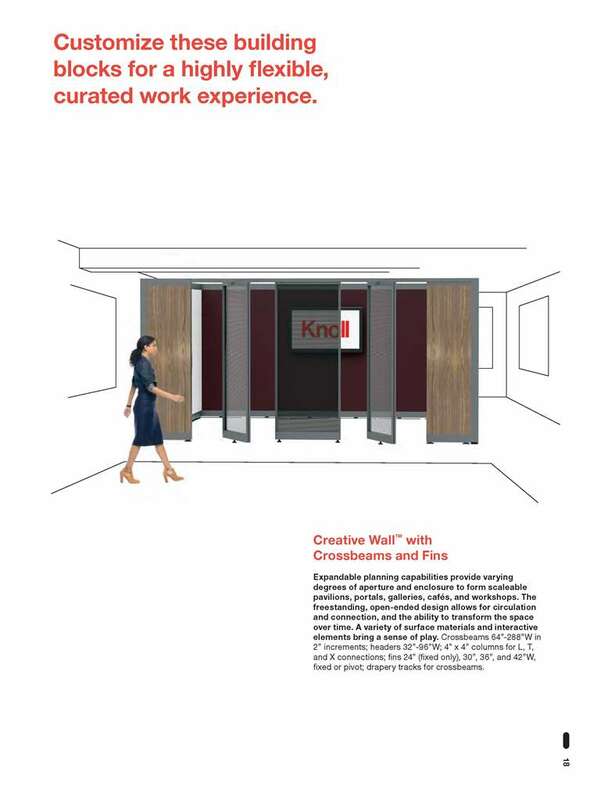 Immersive planning is the fifth approach of r/evolution workplace the Knoll platform that illustrates the range of workplace planning solutions and their defining characteristics. 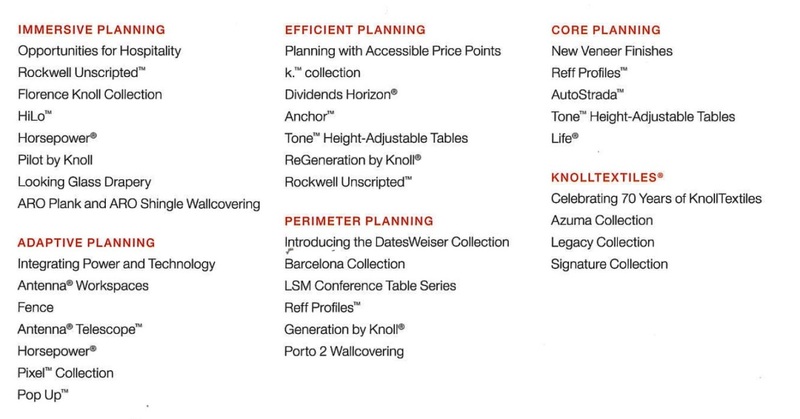 Knoll now explores five distinct interior planning approaches—Perimeter, Core, Efficient, Adaptive, and Immersive—each uniquely addressing real estate, technology and individuals’ needs. 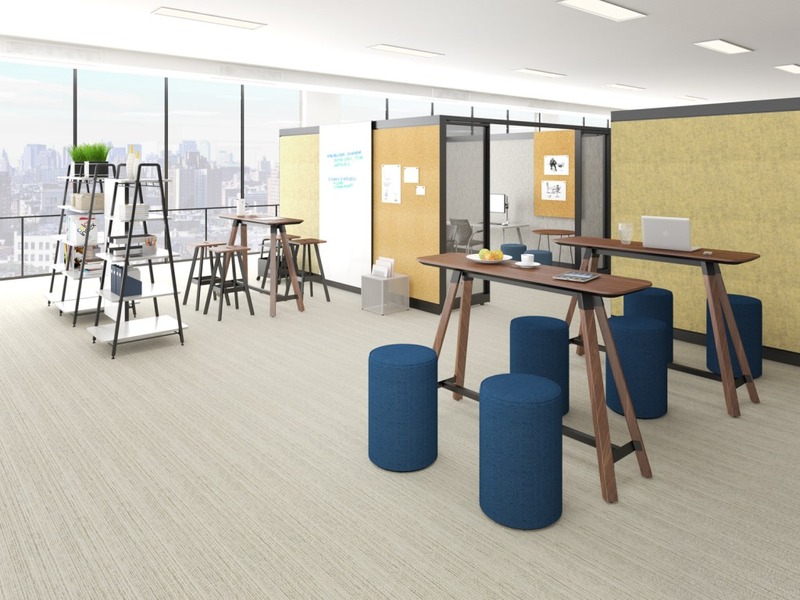 As the lines defining work and life blur, we need a workplace that cultivates community and supports customized experiences. 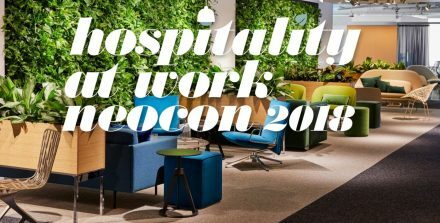 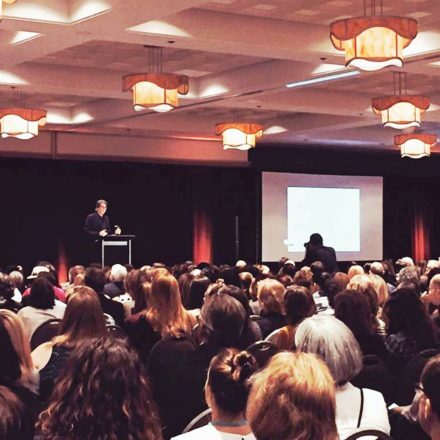 The hospitality work experience takes a people-centered view of work, improving work style, building camaraderie, and enhancing employees’ work-life balance. 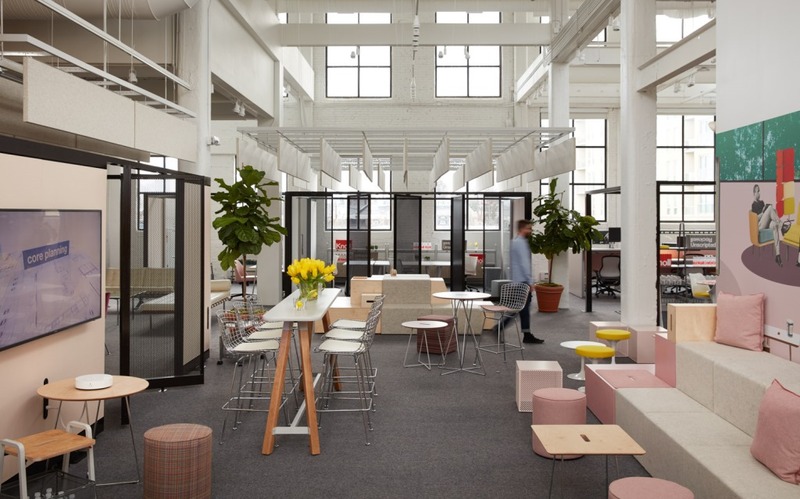 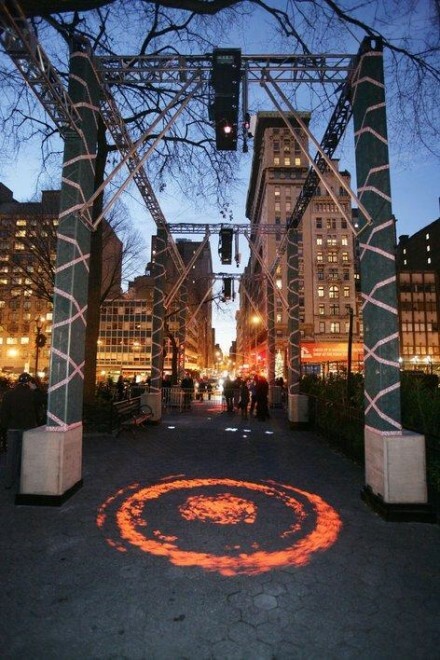 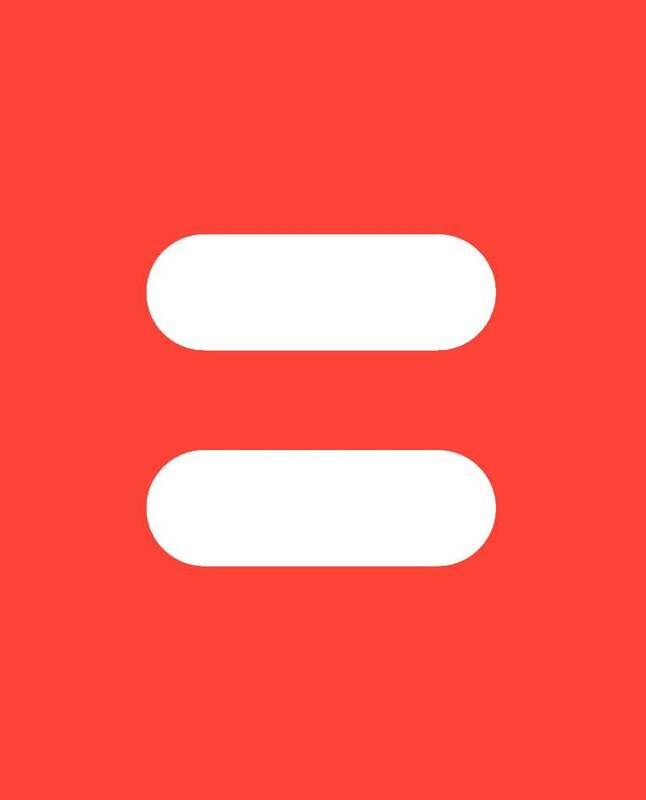 The result: an environment that can transform at a moment’s notice and evolve with use. 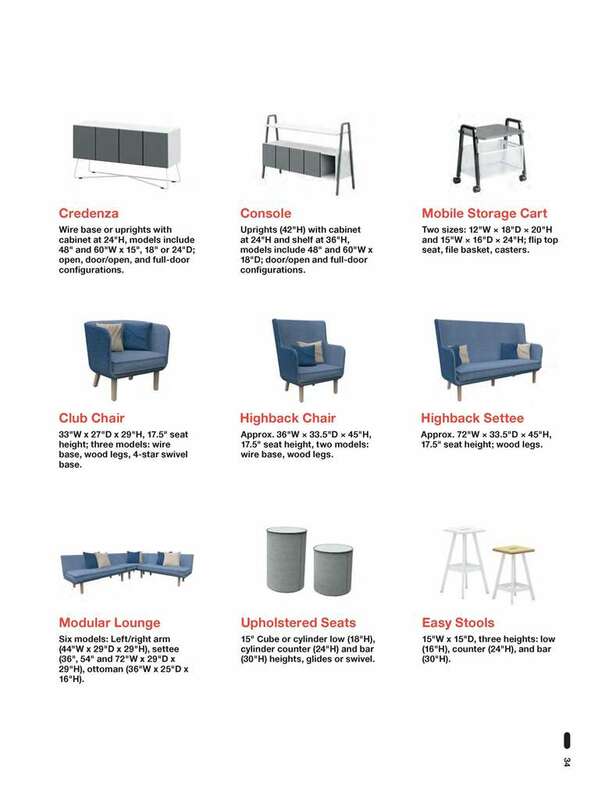 The multi-use amphitheater has Rockwell Unscripted iconic library table at the center, discreetly distributing power to users in various KnollStudio seating and Rockwell Unscripted swivel stools, easy stools and steps. 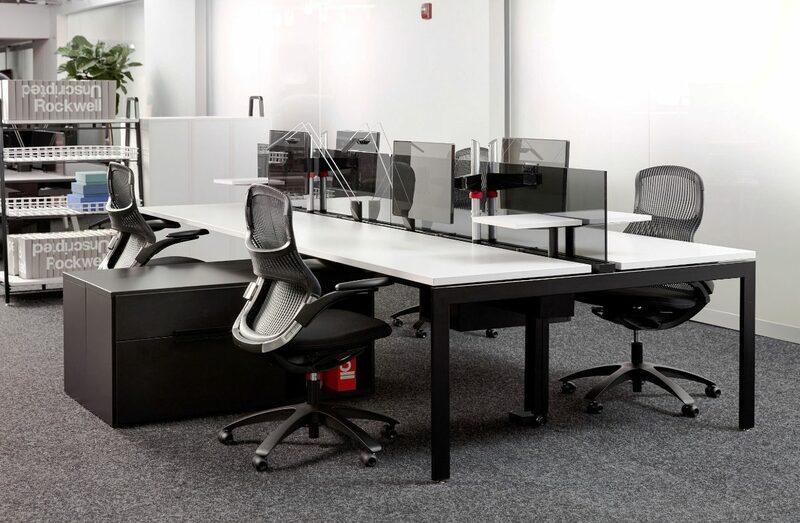 Interpole supports monitor screens at any horizon. 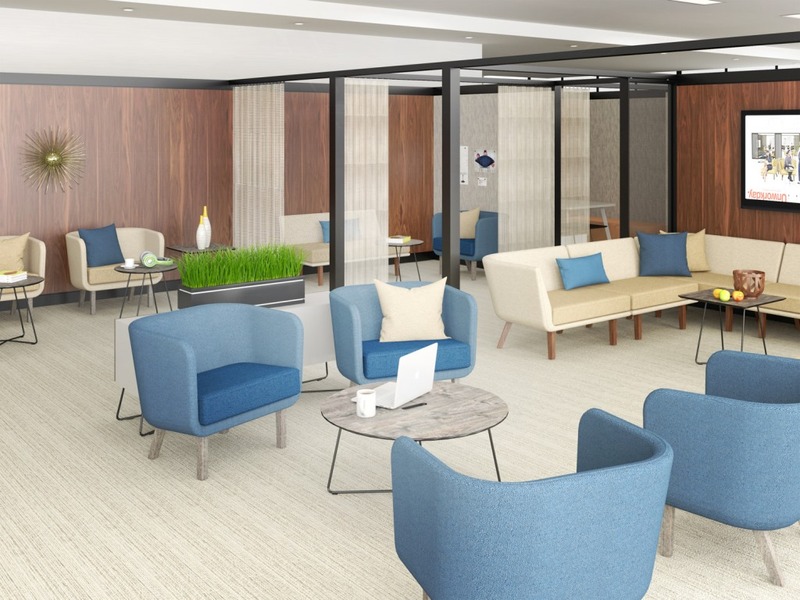 A lobby lounge is defined by Rockwell Unscripted crossbeams and columns, framing a sawhorse work table with an eclectic mix of seating. 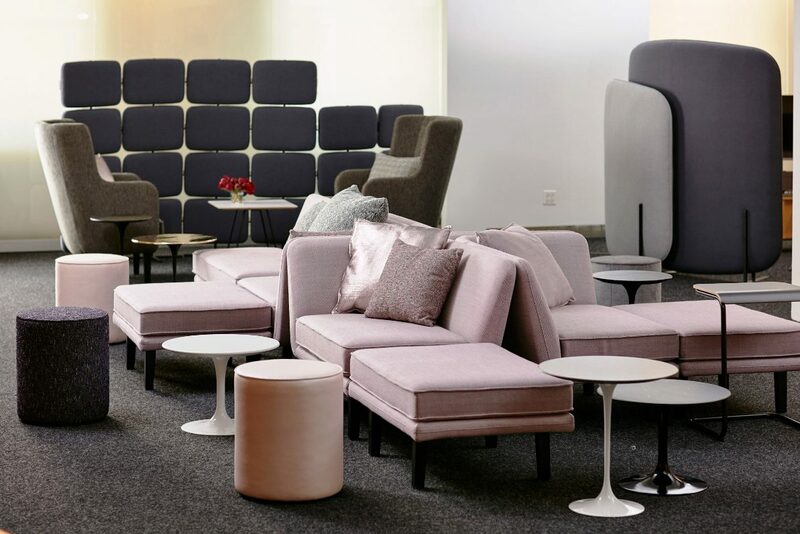 Unscripted Lounge And Screens casual interpretation of the classic concierge, with Rockwell Unscripted upholstered seats, steps and soft storage. 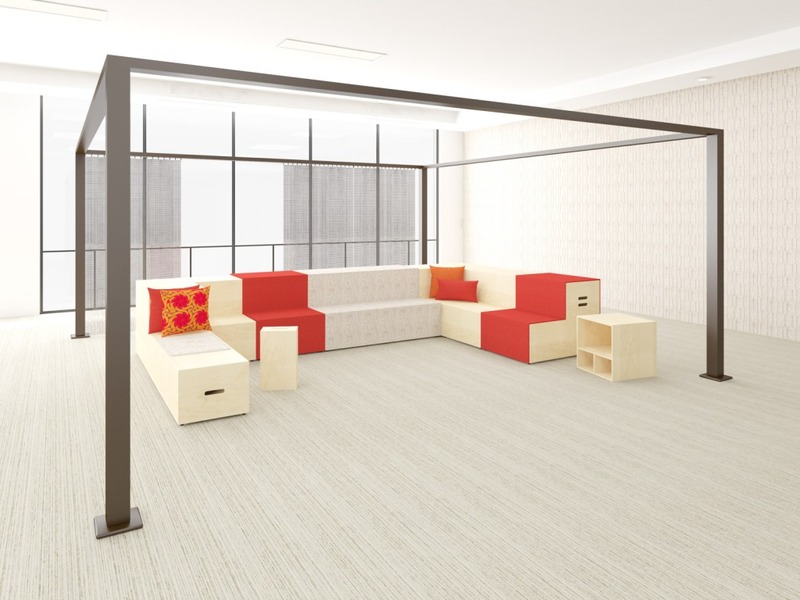 Thoughtfully planned informal lounge areas allow you to quickly connect as you move from here to there. 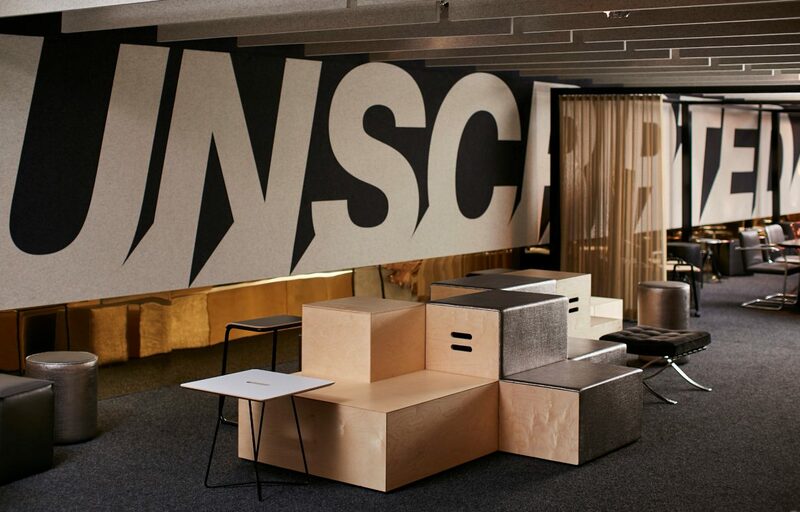 Unscripted lounge pieces throughout the showroom offer spaces to see and be seen. 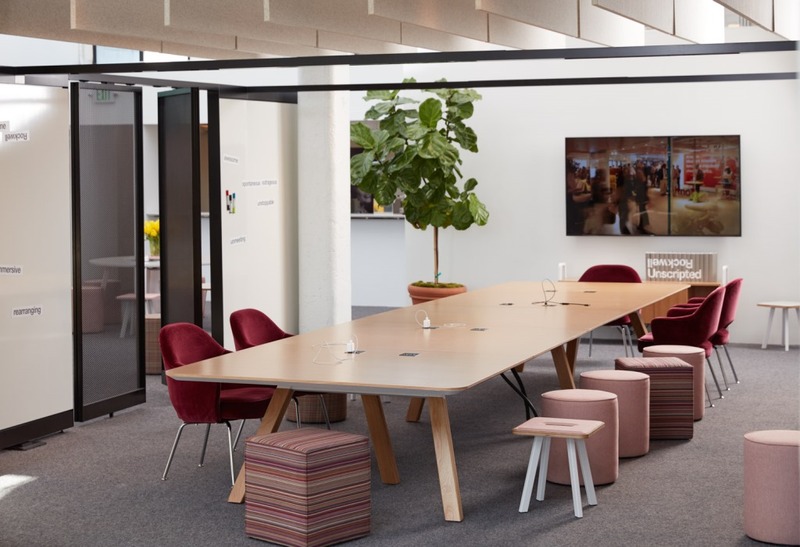 This open pavilion invites people to take a seat, roll up their sleeves and get to work at the Unscripted sawhorse work table, here with MultiGeneration by Knoll light task and Unscripted mobile storage. 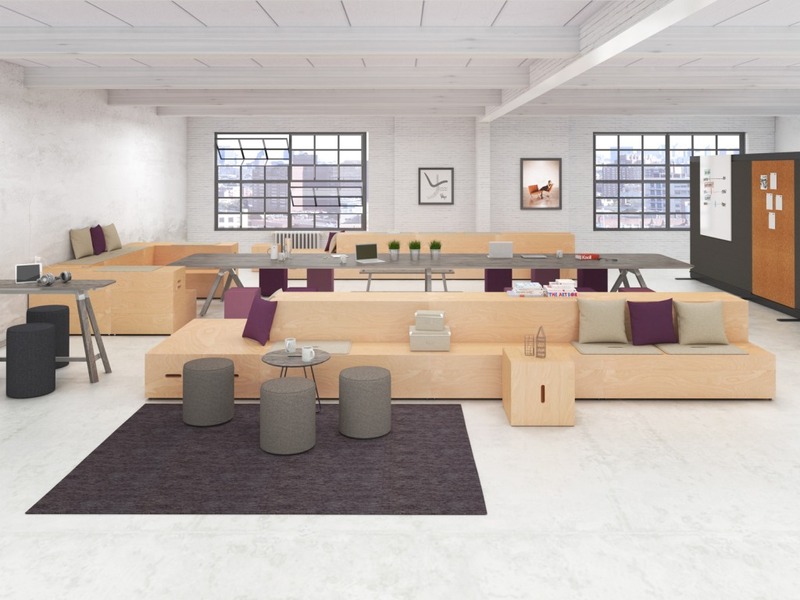 Unscripted tall tables and mix of seating offer casual adjacency. 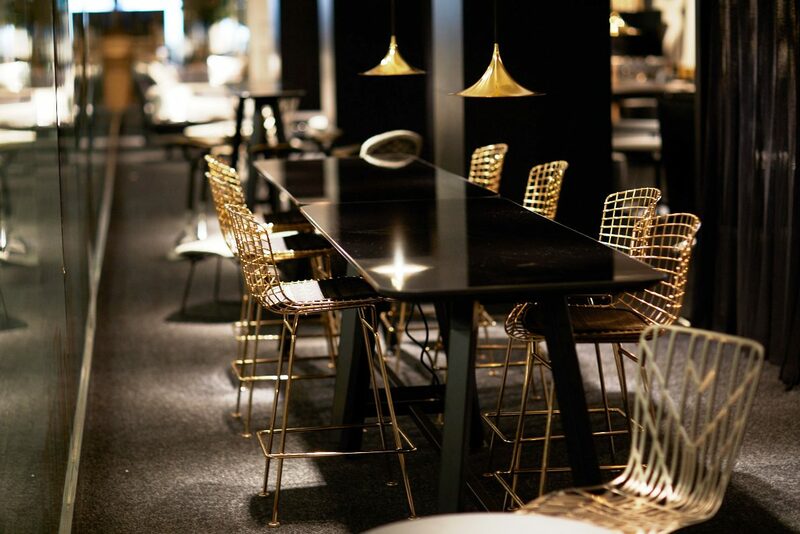 Elements spill out onto the street for an inviting vibe at this sidewalk café setting. 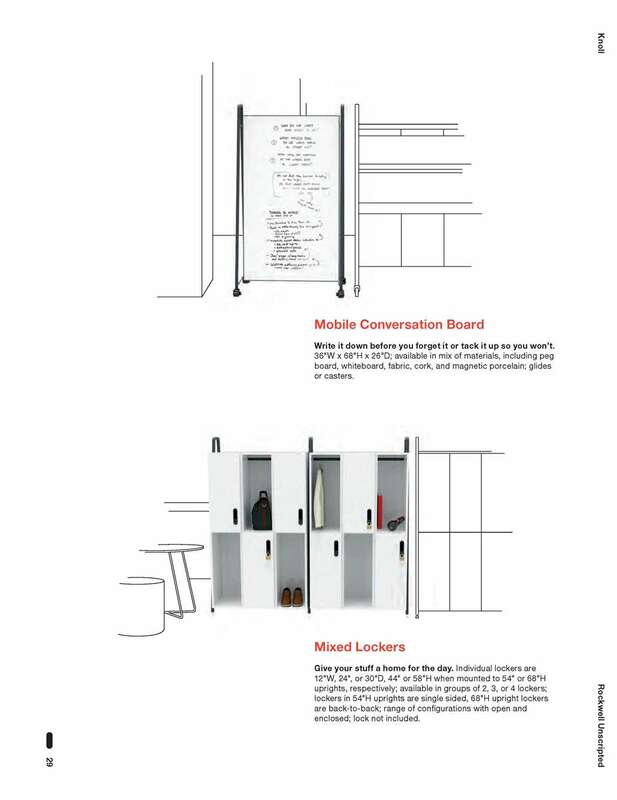 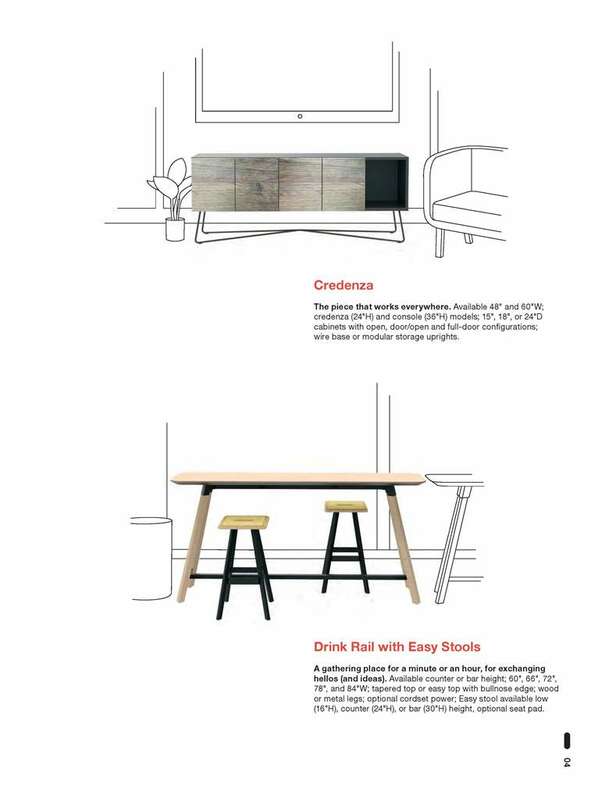 Rockwell Unscripted Creative Wall, paired with dining tables and seating at different horizons offers users more choice. 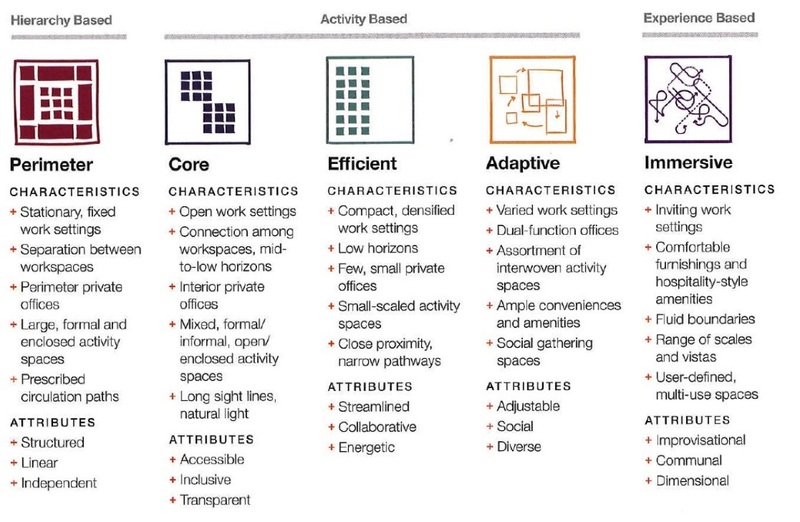 Adaptive planning offers a variety of assigned and unassigned spaces to support diverse work tasks, functions and interactions. 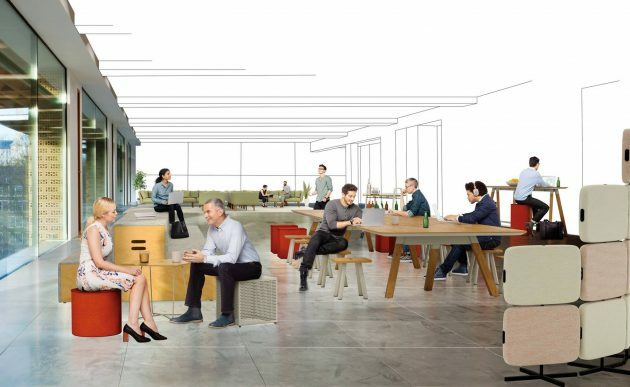 Together, these spaces, along with abundant amenities and user-adjustable elements, are interwoven throughout the plan to promote adaptation and social connections. 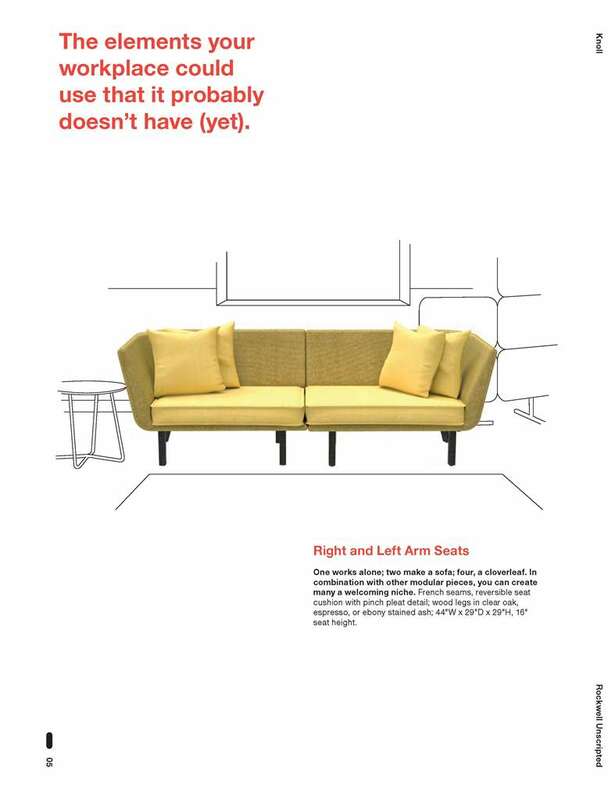 Good ergonomics is about more than just reducing discomfort and preventing injury. 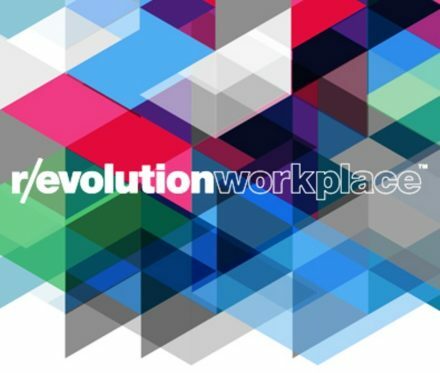 It should take the increasingly collaborative nature of office work into account, and provide solutions to support these new ways of working. 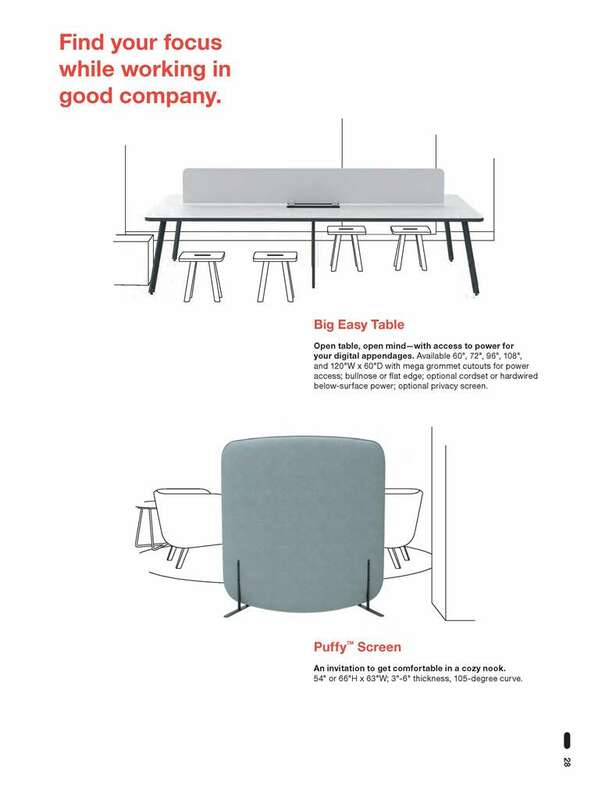 Rockwell Unscripted Puffy screens and modular storage define boundaries of an Unscripted Big Easy table team area with ReGeneration by Knoll chairs. 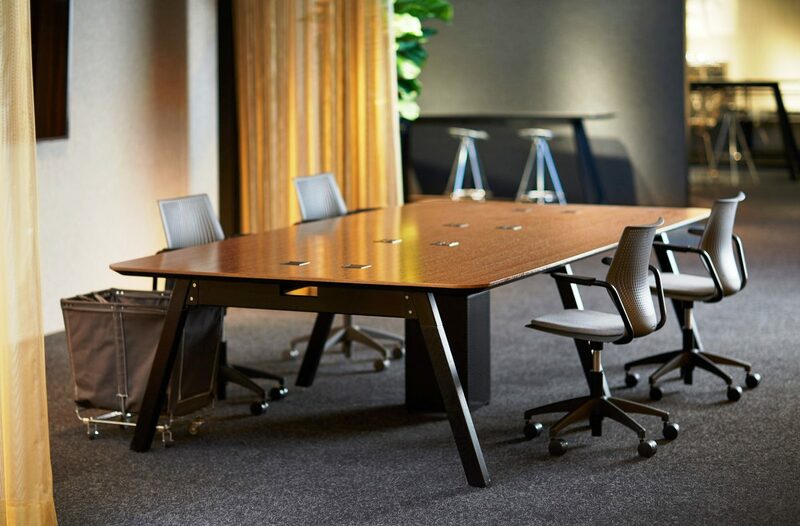 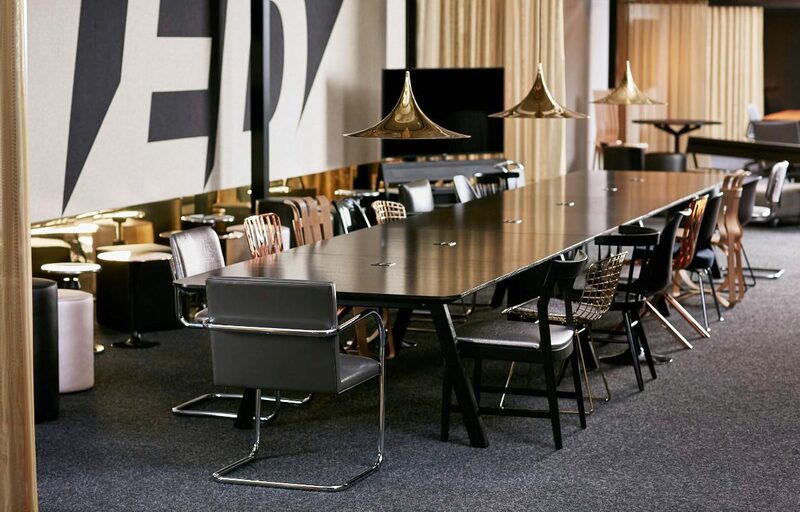 A high-performance team space features Antenna Big Table with new wide end leg and suspended storage, Generation by Knoll, Anchor credenzas and Sapper single and double monitor arms. 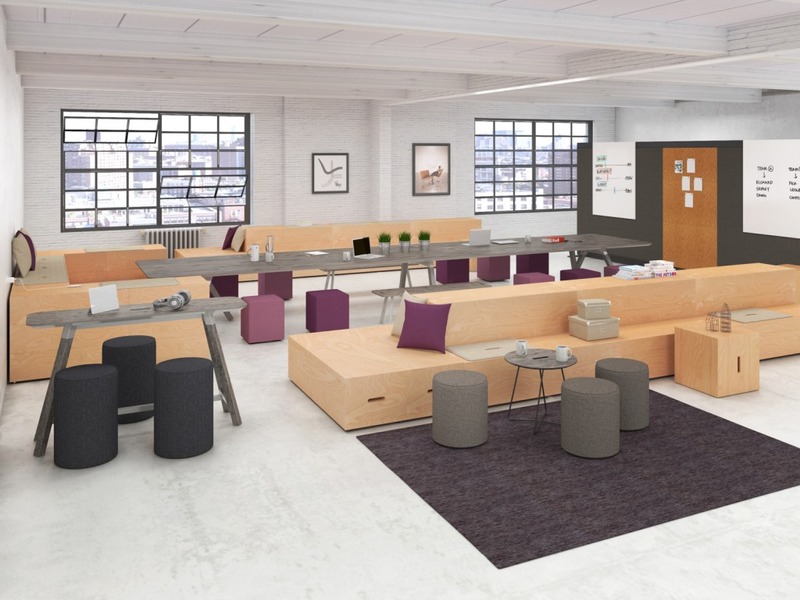 120º planning for a collaborative team environment offers ample individual space while leveraging the shared back-to-back structure and power distribution of Telescope. 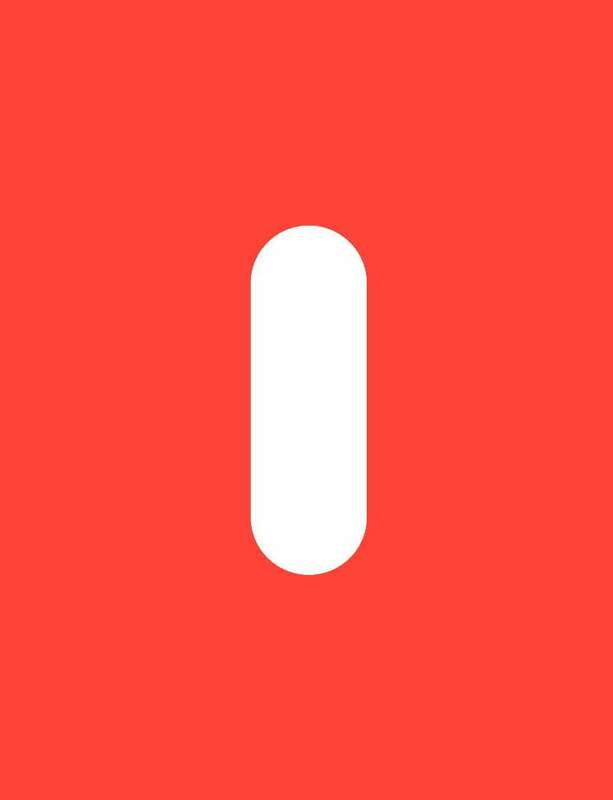 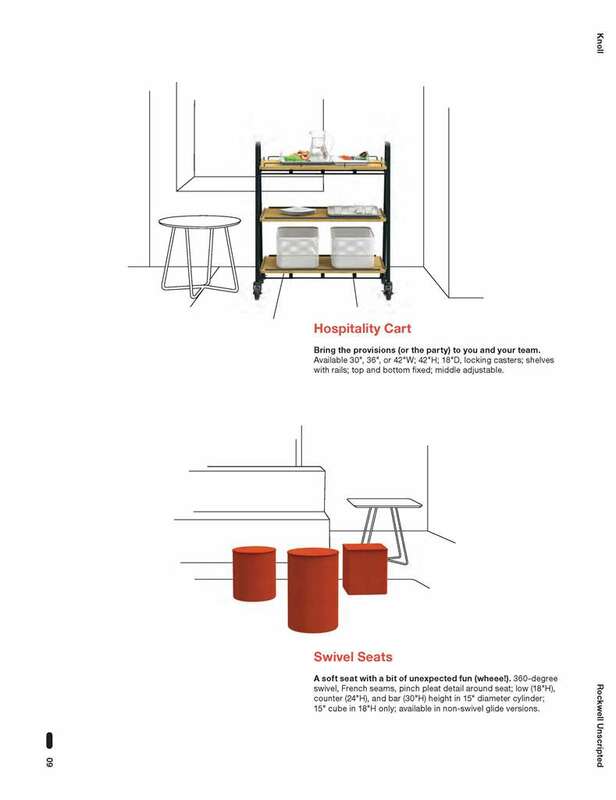 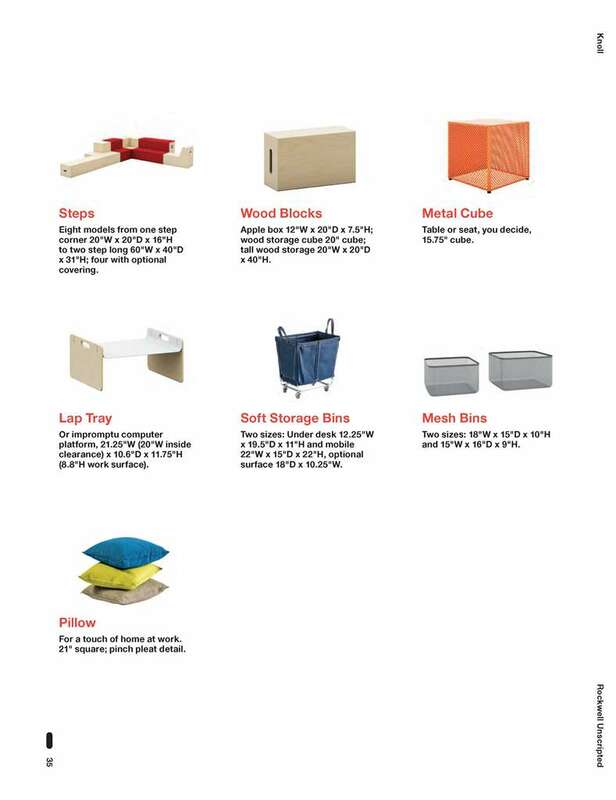 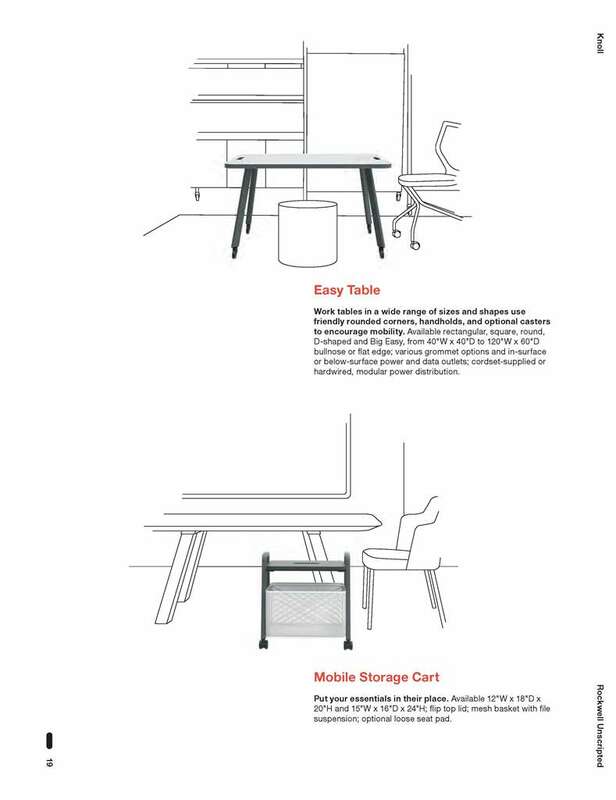 Generation by Knoll, Anchor 12″-wide mobile storage and Sapper XYZ Crossbar provide additional user adaptability. 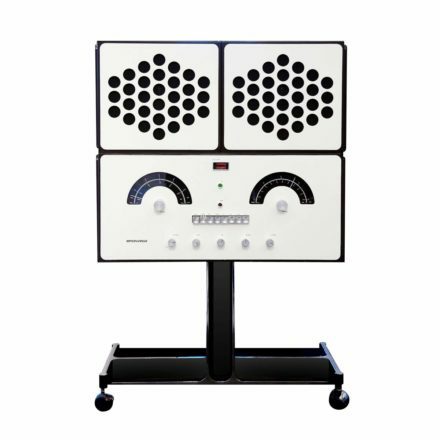 Single-sided Antenna Telescope efficiently accommodates high-density planning with minimal structure and no horizontal feet. 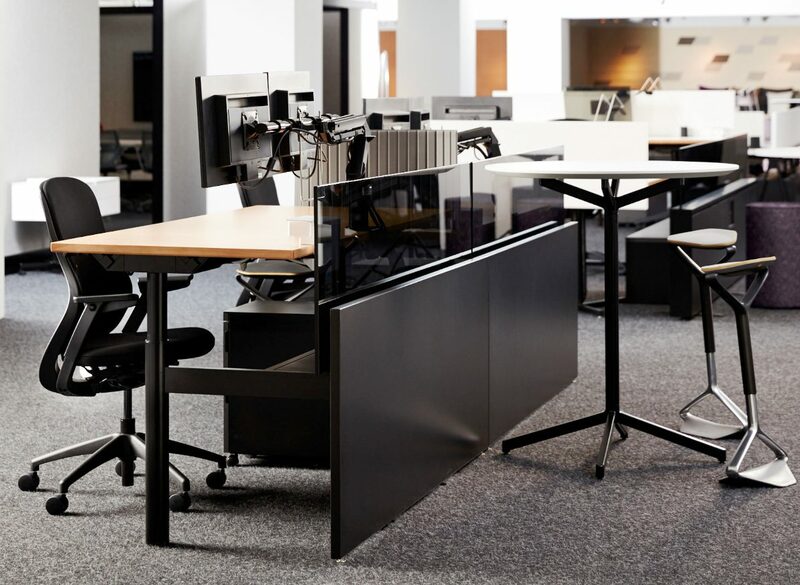 Antenna mobile pedestals discreetly nest beneath the work surface for additional space savings. 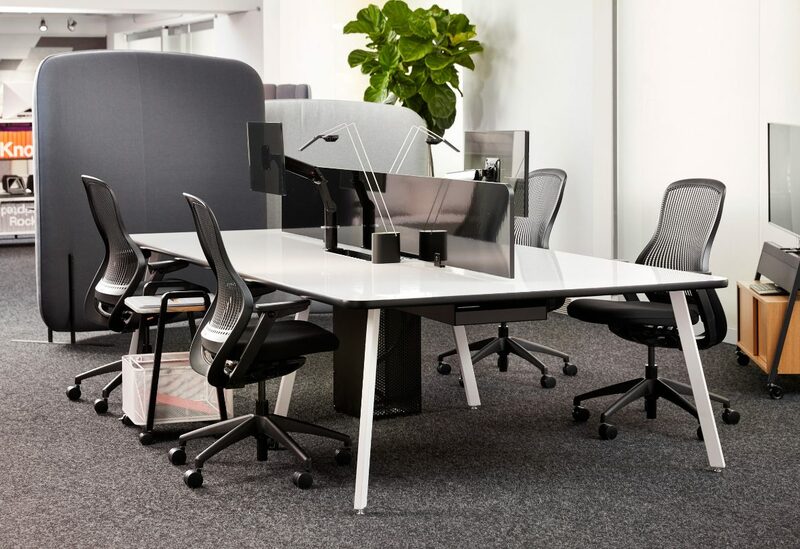 Shown with Generation by Knoll, Sapper XYZ and Sparrow desktop LED. 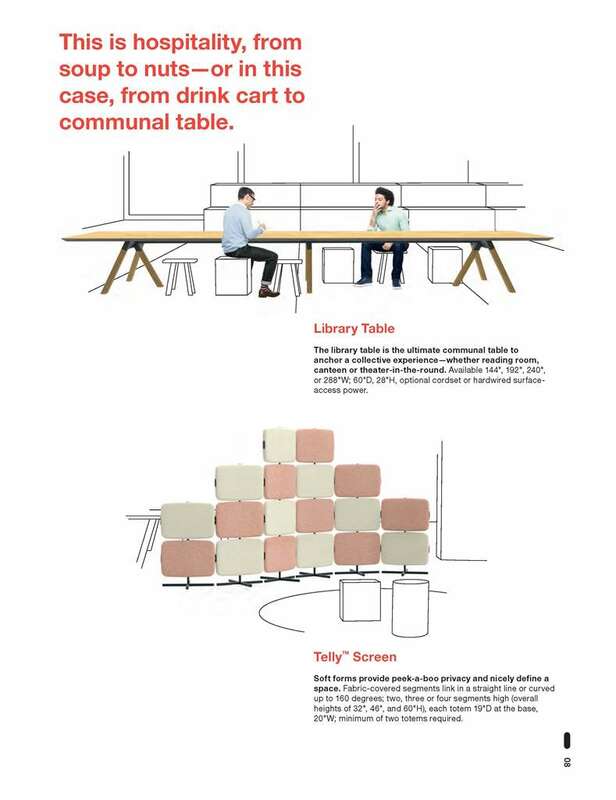 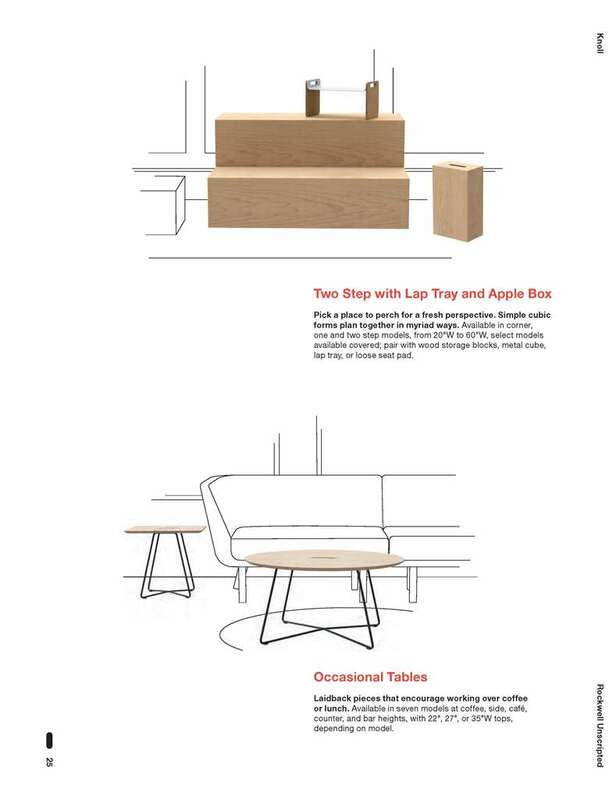 Mobile Pixel tables reconfigure for multiple uses in Unscripted workshops; Unscripted lounge pieces and occasional tables create a secondary activity space. 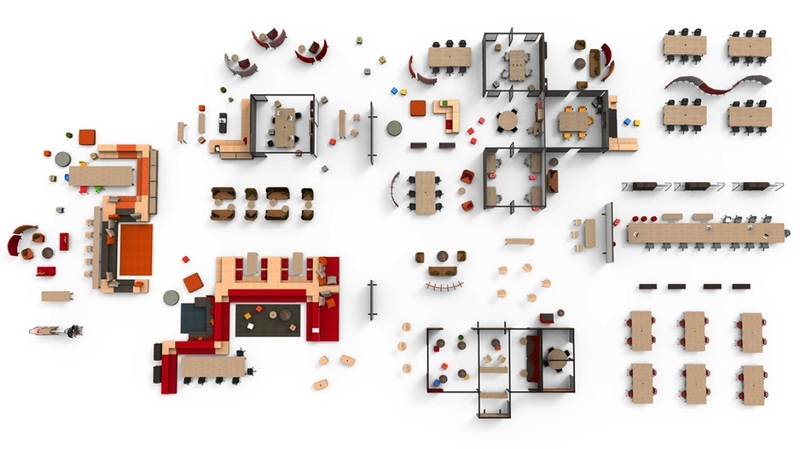 To support an agile workforce, you need nimble technology. 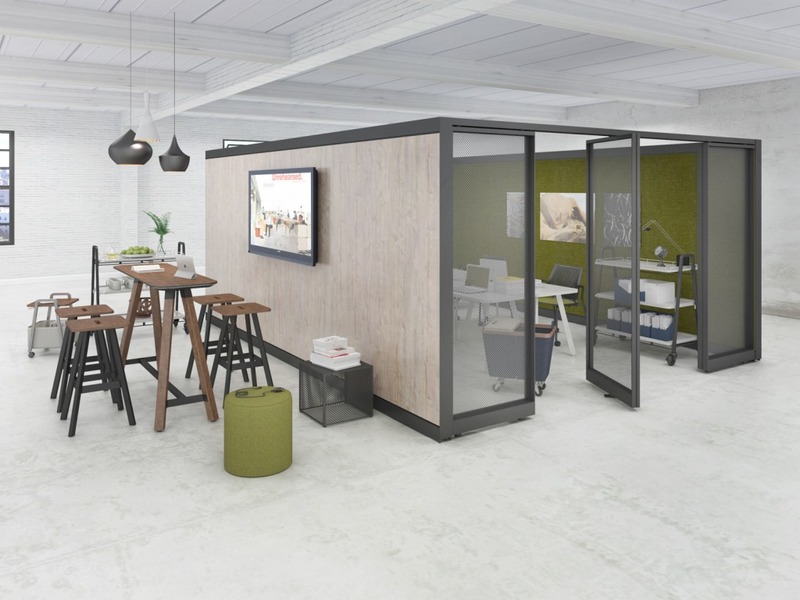 A mobile projector becomes an impromptu small group brainstorming tool and multiple material surfaces offer additional ways to collaborate. 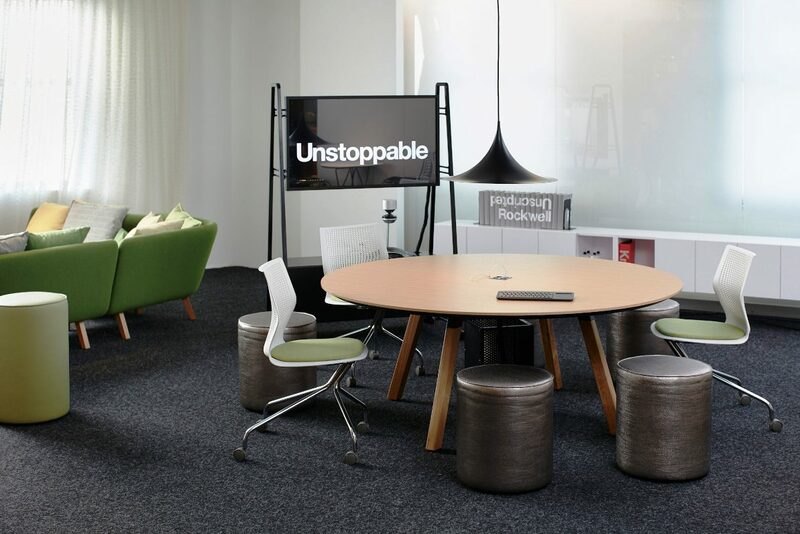 Rockwell Unscripted round Big Easy table with MultiGeneration by Knoll and Unscripted stools. 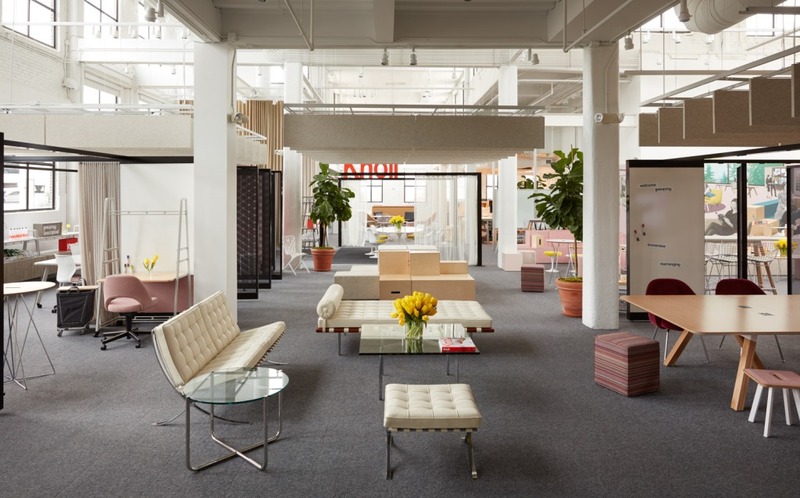 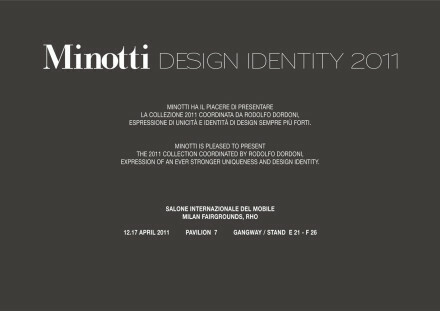 These brands — Knoll Office, Knoll Studio, Knoll Textiles, Knoll Extra, Spinneybeck | FilzFelt, Edelman Leather, Holly Hunt, and DatesWeiser — reflect Knoll’s commitment to modern design that meets the diverse requirements of high performance workplaces and luxury interiors. 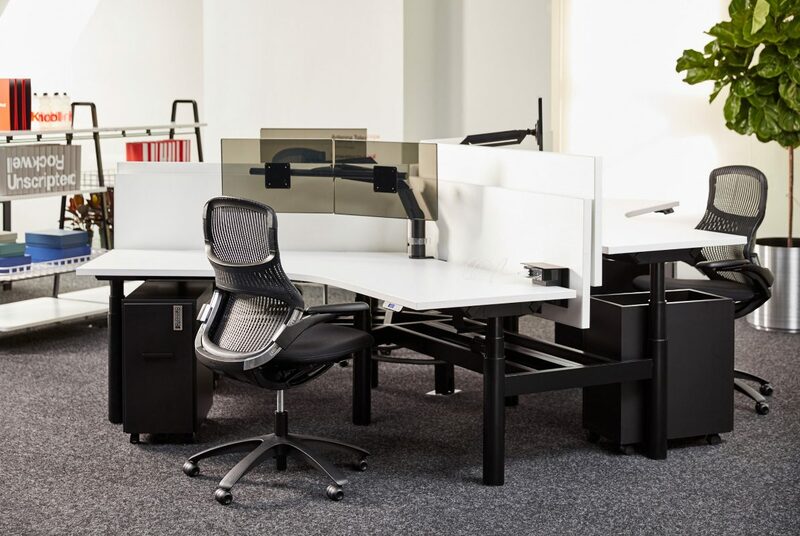 It’s interesting that a simple and open furniture setup can help create a more productive and inspiring work environment. 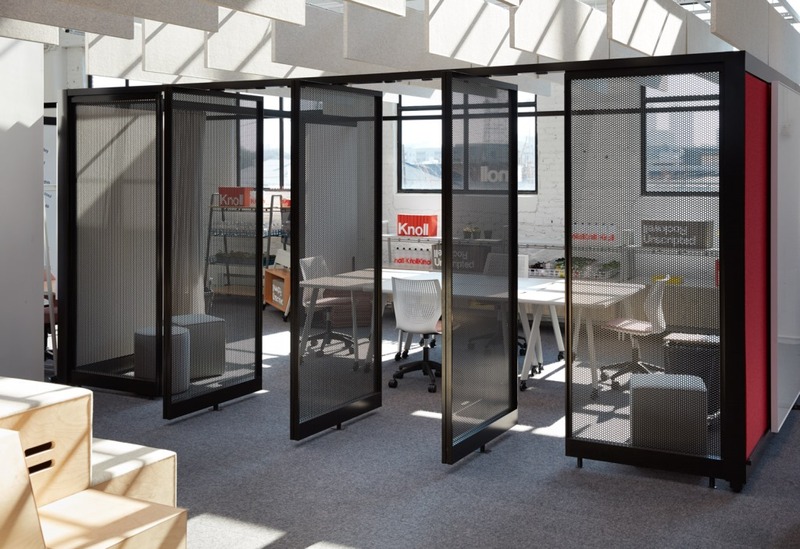 My office has a very similar feel to what Knoll’s products provide. 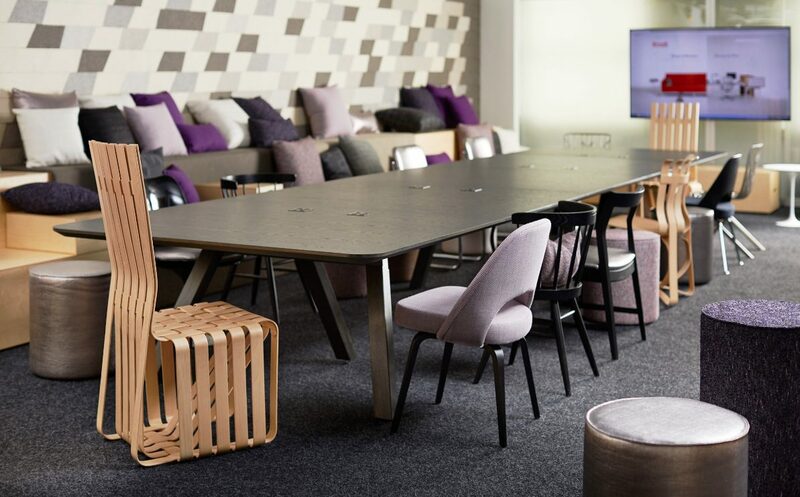 There are areas for people to gather and share ideas spontaneously, which I like because that is usually the way creativity strikes.